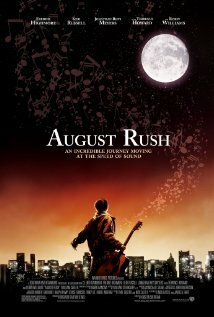 August Rush is a sweet heart-warming family film with a great musical soundtrack. At first glance, I thought I was watching a movie produced by Walt Disney Productions. It is not. However, this movie is for both kids and adults to enjoy even though it has fairy tell elements to it. August Rush (Highmore) is an 11 year old who hears music in his head “everywhere.” He is the illegitimate son of two musicians and inherits an amazing musical talent that becomes apparent after he leaves a boys home for orphans where he was raised and heads to New York City to look for he parents. He is taken in by a “wizard” played by Robin Williams who is a whacked out eccentric musician who houses children in a warehouse in exchange for their work as street musicians. Williams exhibits both good and evil qualities, as he gets involved in the children he strangely cares for. The beautiful Keri Russell plays the role of a young woman named Lyla who falls in love with a stranger (Jonathan Rhys Meyers) and becomes pregnant the night they meet. Having shared an extraordinary evening together, Lyle Novacek (Russell) and Louis Connelly (Meyers) are meant to be together yet they are torn apart by circumstances. Both Lyla and Louis give up performing publicly to later find they are unhappy and each begin searching for a sense of purpose that leads them both back to performing again. August is a child prodigy who achieves beyond anyone’s wildest imagination and gets an opportunity to perform with the symphony in New York’s Central Park. The song “Raise It Up” written specifically for the movie, was dominated for Best Original Song in 2007. The guitar rhapsody by August Rush himself is a wonderful surprise. Though his ability to perform with such perfection and excellence is unbelievable, it works. It is hard to find a family film for everyone to enjoy. I found it for you.